It’s always the little things that trip me up. 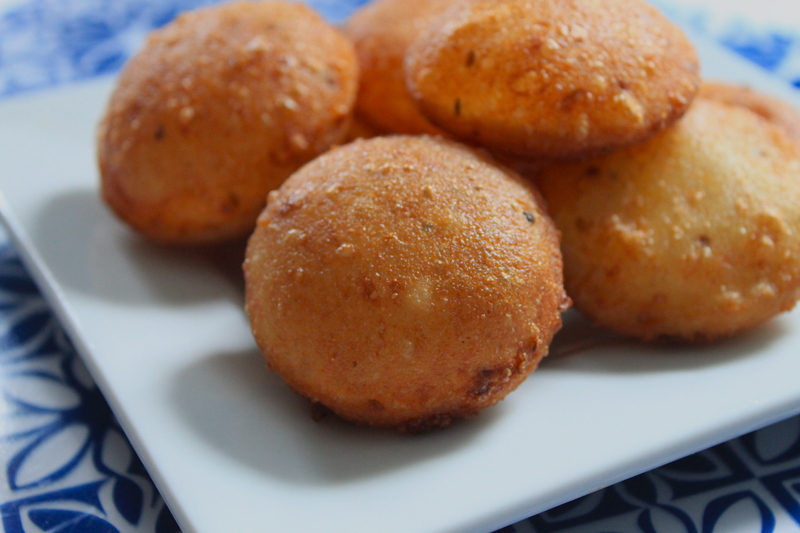 I was thinking of making arepas last weekend when I came across a recipe for Venezuelan arepitas dulces. 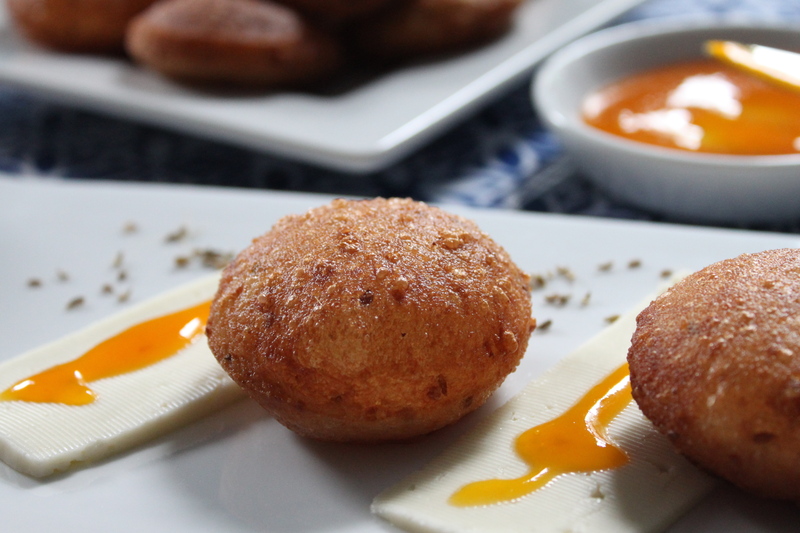 Also known as arepuelas or anisitas in Colombia, they’re smaller arepas sweetened with melado de papelón and fried for breakfast or dessert. Infused with whole anise seeds, they seemed as soothing and comforting as the candies in your grandmother’s purse. Comparing online recipes, I was able to follow the general idea but they were frustratingly unclear about measurements and times, what kind of cheese to add if any, and the best way to form them. Picking and choosing my favorite elements, I gathered from Sumito Estévez that the hot water added to the cornmeal could be steeped in any combination of spices beforehand, that I was underusing allspice (guayabita, my new favorite ingredient) and that arepitas need to abombar when added to the hot oil (my new favorite cooking term that means to puff up but translates as “bombify”). I thought they would be great to try on a quiet Sunday morning, but starting late, I rushed through the process. Unsure of which recipe I wanted to follow, I decided to follow them all at once. Not surprisingly, my Sunday plans went up in a cloud of grease. The arepitas did not bombify but stayed defiantly flat, weighted down by canola oil and covered in splotches where the cheese I threw in at the last minute had burned. They couldn’t be saved. Determined to try again, I brought in my favorite Venezuelan consultant/cousin-in-law, Andrea. 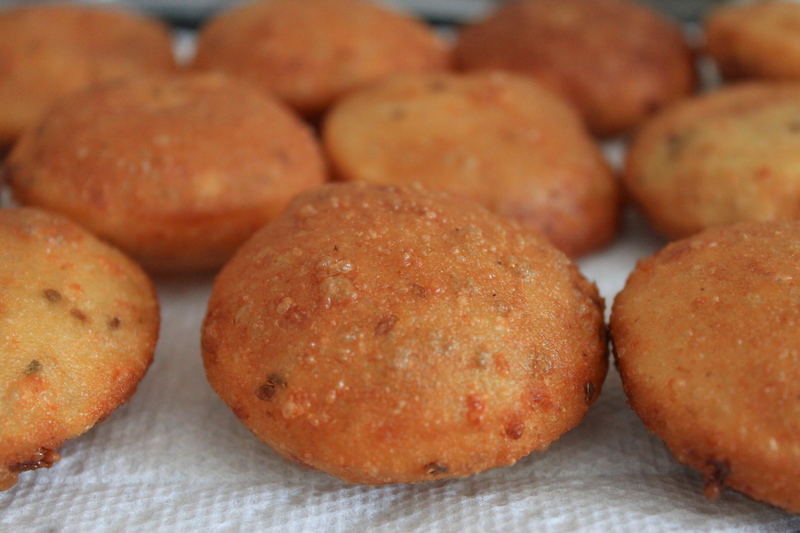 When I first started my blog, one of my earliest entries was for Kako’s Arepas. I didn’t realize it then but the recipe had come from his wife Andrea. This time, I decided to go directly to the source. Sending me a traditional recipe that started with grinding corn (why doesn’t Kitchen Aid have a corn mill attachment? ), I fast forwarded to the post-P.A.N. present and picked it up from there. I let the spices steep a little longer and the dough rest. I was cautiously optimistic but mentally preparing for batch three. When I added the first arepita to the oil and watched it go plump all over, I puffed up a little myself. Frying up the rest, I finally had my Sunday morning. These are best served immediately but I reheated a few later that night and they were fine. I served them alongside thin slices of queso blanco and a mango and pepper jam. Bring water to a simmer. Add crushed guayabitas, star anise, and cinnamon. Remove from heat and allow to steep. To make the melado, combine papelón with 1/4 cup of water in a small saucepan. Set over medium heat and bring to a simmer. Continue to cook for 5 minutes and set aside to cool. Combine cornmeal, salt and anise seeds in a large bowl. 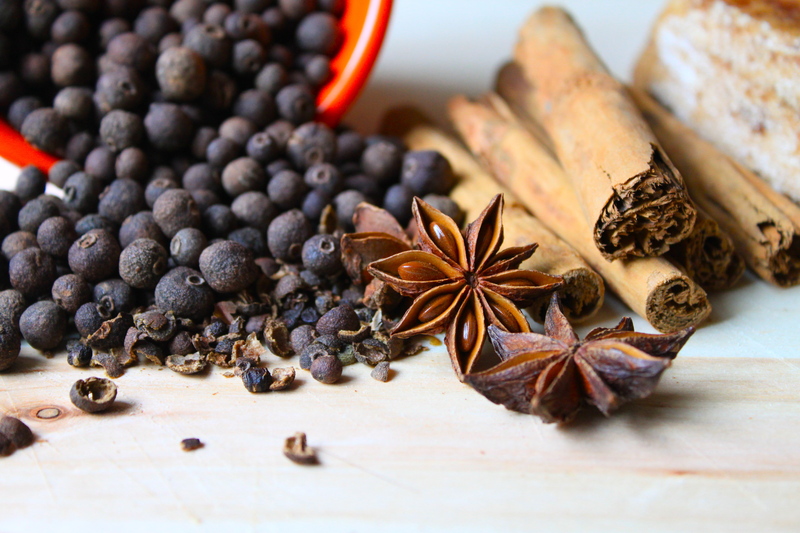 Strain spice infusion into bowl and discard spices. Add grated cheese and cooled melado. Knead well. Add warm water one tablespoon at a time as needed to form a smooth mass. Cover with a damp towel and set aside to rest, 20-30 minutes. Shape the arepitas by hand or roll out the dough, on a silpat or in between two sheets of wax paper, to about 1/4″ thick. Using a round cookie cutter punch out circle about 2″ wide. The scraps can be gathered together and re-rolled once. 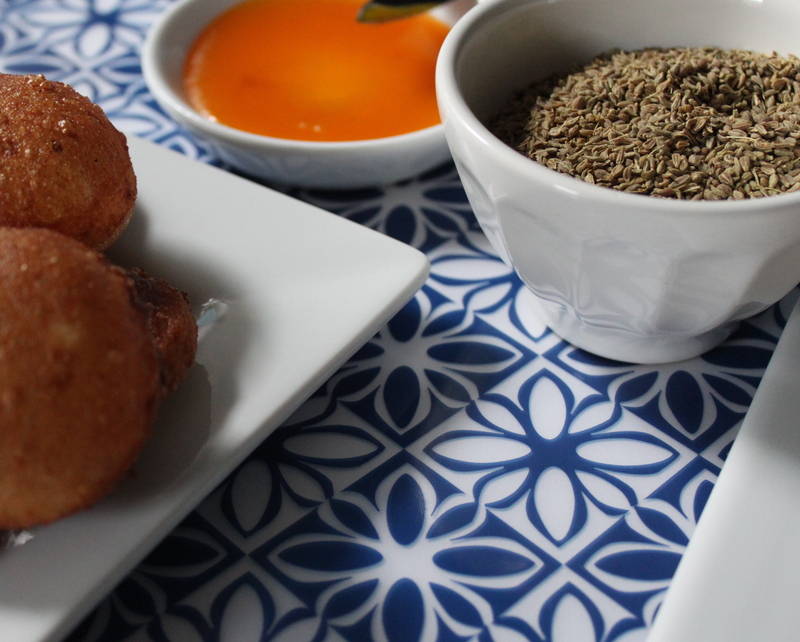 Carefully add the arepitas to the oil, 2-3 at a time and fry until golden about 2 minutes, turning once. Drain directly on cooling rack or on paper towels. Serve immediately with jam and cheese. P.A.N., pre-cooked cornmeal comes in both white and yellow is sold in Latin American grocery stores though it’s increasingly available in larger chains as well. Also known as panela, piloncillo, or rapadura, it’s unprocessed cane sugar sold in hard, flat discs or cones in Latin American grocery stores. I stumbled on your recipe after being invited to a Venezuelan style dinner. I offered to bring a dessert and this sounded wonderful. I followed your recipe and they turned out beautifully! I left half of the batch plain and I rolled the other half in a cinnamon sugar mixture. Yummy! Thanks! I’m so happy they worked for you! I’ll definitely try rolling them next time as well!